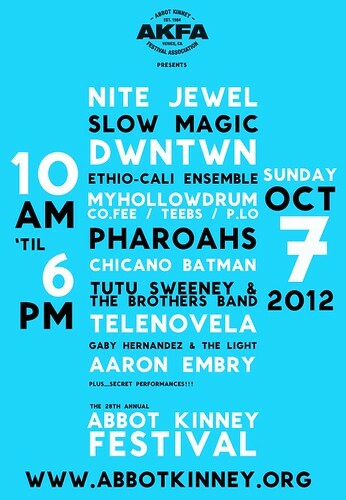 Abbot Kinney Festival Music Lineup 2012 - Yo! Venice! Featured musical acts include Nite Jewel, Slow Magic, DWNTWN, My Hollow Drum, Pharoahs, Chicano Batman, Tutu Sweeney and the Brothers Band, Telenovela, Gaby Hernandez and the Light, Aaron Embry and more! The festival will be held on October 7th from 10am-6pm. More on this when they release the set times and stage locations.